Jaundice is a visible yellowing of the skin and eyes that occurs when bilirubin is deposited in tissues below the skin and in the sclera. Bilirubin is an orange­yellow coloured pigment of bile, formed when haemoglobin in red blood cells is broken down. • Hyperbilirubinaemia:​High blood levels of bilirubin. • Unconjugated hyperbilirubinaemia: ​Bilirubin in the blood that has not been metabolised properly by the body and is unable to be excreted from the body in urine/faeces. It can result in dangerous neurotoxic effects on the baby’s body. Neurotoxicity can lead to bilirubin encephalopathy, a condition which can cause seizures, coma, cerebral palsy, hearing impairments and developmental delay. • Conjugated hyperbilirubinaemia: ​The bilirubin is metabolised but high levels of it have built up in the blood, usually because of some liver dysfunction. • Birth complications (e.g. cephalohaematoma). • Family history of diseases that cause haemolysis (e.g. spherocytosis, G6PD deficiency). • Maternal diseases (e.g. if mother has hepatitis). • Ethnicity (e.g. African, Mediterranean, East Asian). • Pale­coloured stools or dark urine – seen in biliary obstruction. • Unwell sick­looking infant – jaundice can be a result of sepsis and gastrointestinal obstruction. • Plethora (reddish­purple colouring) – seen in polycythaemia. • Enlarged liver on palpation – seen in hepatitis and certain metabolic problems. • Hydration status – dehydration may exacerbate jaundice. • Sepsis (severe infection):​Give antibiotic therapy. • Biliary Atresia​(a disease where the baby’s bile ducts are absent or blocked): Needs surgery (Kasai procedure). • Breastfeeding failure:​This occurs when babies aren’t getting enough breast milk, and thereby lose a lot of weight, which causes increased concentrations of bilirubin. This should be managed by trying to increase the mother’s milk supply, increase the frequency of feeds, and improve the baby’s latching onto the breast (to enable good sucking). Adequate breast milk/formula aids elimination of bilirubin in urine/faeces. 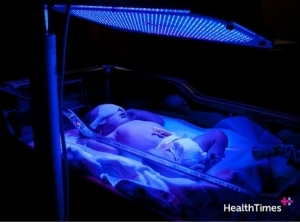 • The act of using visible light (normally blue­green coloured) to treat severe neonatal jaundice. • Purpose: To help prevent neurotoxicity from high levels of unconjugated bilirubin in the blood. • How: Exposing the skin to the blue­green light results in conversion of unconjugated bilirubin, making it water soluble and able to be excreted from the body. • Safe and effective – potential problems which need monitoring for include: overheating, diarrhoea, rash and damage to the retina. • Babies should continue breastfeeding during this time. • Decreases the chance of needing to give exchange transfusions (see below). • Note: This is not the same as sunlight exposure, which is NOT advised for the treatment of neonatal jaundice. Sunlight is a source of multiple light wavelengths, and only a limited amount of such is suitable for managing jaundice. Sunlight also carries the risk of sunburn. • The process of removing part of the baby’s blood and replacing it with donor blood. • Purpose: To remove toxins or abnormal blood components (in this case, excess bilirubin). • The Consultant Neonatologist will decide if an exchange transfusion should be performed, based on serum bilirubin level trends, the clinical symptoms of the baby, and any other underlying conditions.